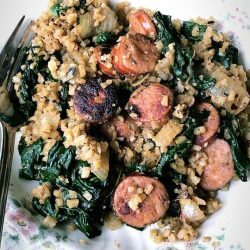 This CHICKEN SAUSAGE, SPINACH, & CAULIFLOWER RICE SKILLET is super delicious AND super simple to throw together. Only 7 ingredients & it cooks all in the same pan! Perfect for those doing Whole30, Paleo, Keto, Low-Carb, Gluten Free, or just overall trying to eat healthier while not sacrificing flavor. Today is Day 12 for me in my 30 days of Whole30! (You can find what I ate in week 1 here.) I’ve got 20 pounds to lose & even though I haven’t stepped on the scale since I started (as per the rules) – I can already tell a major difference in how my clothes are fitting. I even have a couple pairs of jeans that I couldn’t wear 2 weeks prior to now that fit me again… that’s such a great feeling and makes all this not stuffing my face with biscuits, gravy, & sour patch kids totally worth it. 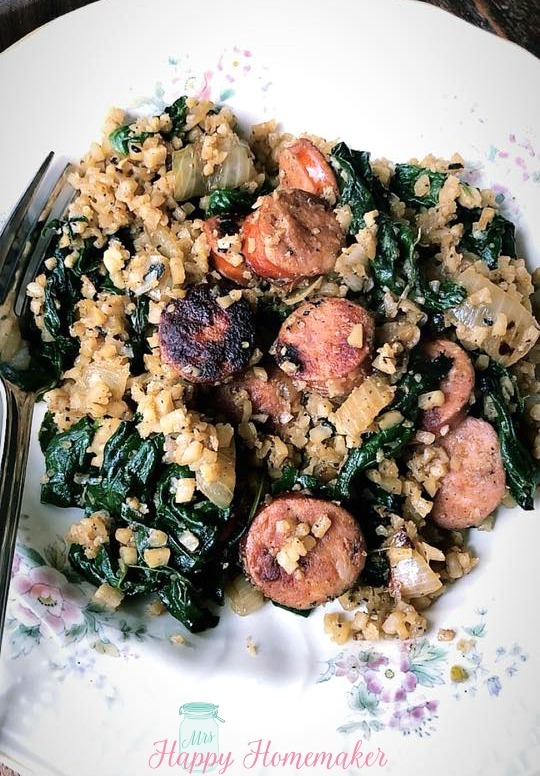 I’ve been doing a lot with cauliflower rice since I started this journey. It’s really easy and time efficient to create a variety of dishes with it. I never thought that I’d be saying that because I really don’t like cauliflower! But…. it’s pretty good riced and it absorbs the flavors that you add to it pretty well. (here’s a plug to the Cilantro Lime Cauliflower Rice & the Pork Fried Cauliflower Rice that I’ve recently posted). 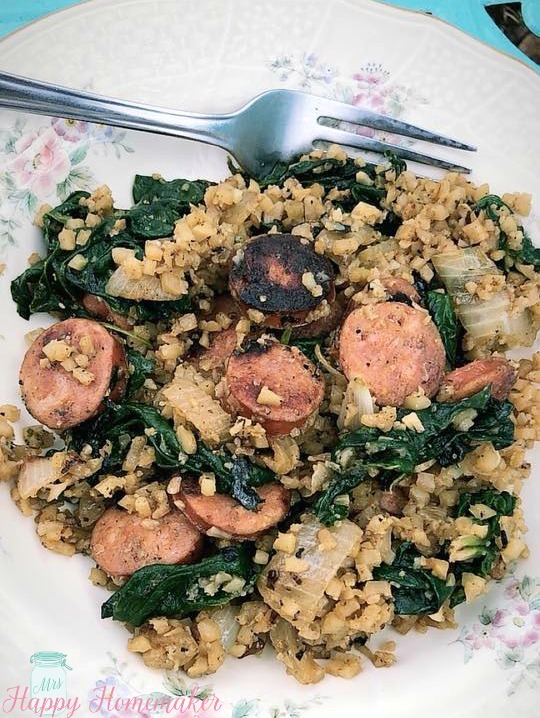 This Chicken Sausage, Spinach, & Cauliflower Skillet is a dish that can be whipped up in no-time and is becoming a go-to healthy meal for me because of how yummy it is & how easy it is to throw together. Yield: Serves 2 - double the recipe as needed! In a large skillet, heat the oil, butter, or ghee. Sauté the sliced chicken sausage with the diced onion on medium-high heat, stirring often. Season with a little salt & pepper to make the onions sweat. 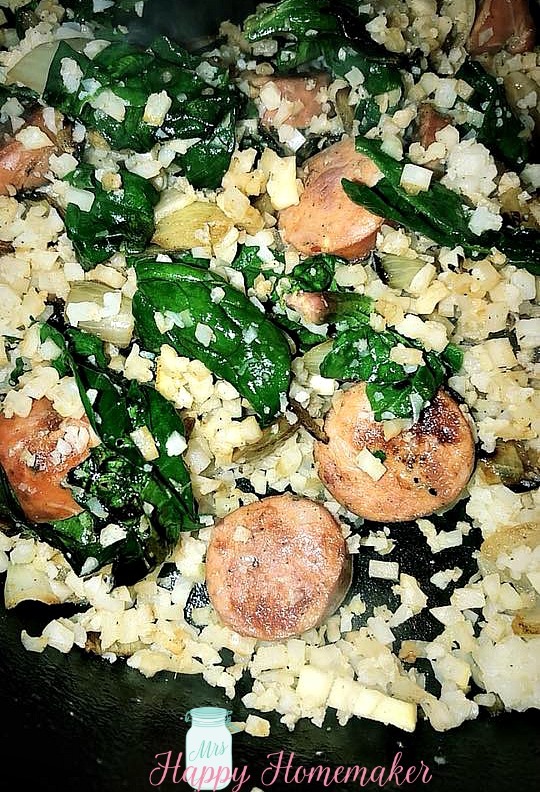 When the chicken sausage has lightlybrowned on both sides & the onions are translucent, stir in the fresh spinach & minced garlic. Cook, while stirring, for about 2-3 minutes. Add in the frozen cauliflower rice & crank the heat up to high, stirring continuously. Cook for 1 minute. Add the chicken stock, & cook on high for another 5-7 minutes – stirring often, until the cauliflower rice is the texture you desire. Add more chicken stock if you need to. Season with a little more salt & pepper, if needed.